Detail: Glass bottle covered in wire mesh with pedestal base. This model was made for French market only. 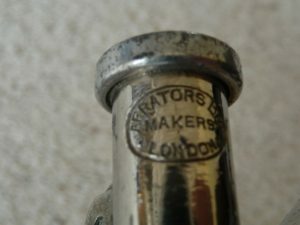 Markings: Aerators Ltd, Makers, London. 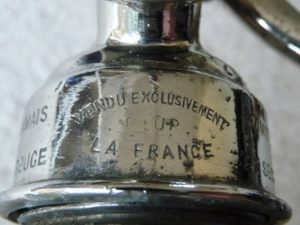 VENDU EXCLUSIVEMENT POUR LA FRANCE’ & ‘LA LIQUIDE NE DOIT JAMAIS DEPASSER LA LIGNE ROUGE’ & ‘ADMETTRE LE GAZ LENTEMENT EN SEQUANT ENERGIQUEMENT ‘ on collar. Notes: Capacity 3 glasses. This syphon needed to have the bulb in place during use to stop the gas escaping. 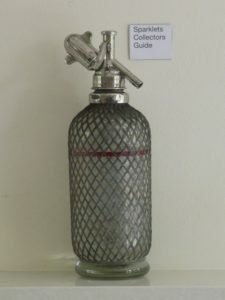 It is smaller and much less common than the later taller Standard “D” syphon. Takes bulb size B, code SCG/BUB.